Playwright and star Gretchen Cryer flanked by Johnson family actors Jesse and Don. 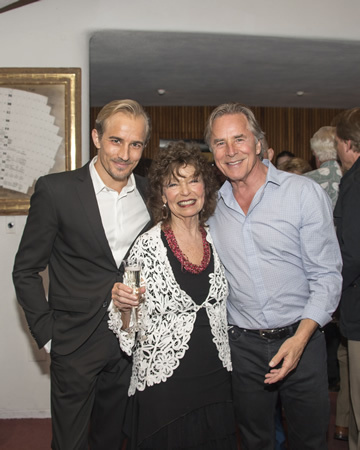 Television actors Don Johnson and Melanie Griffith attended the opening gala of “I’m still Getting My Act Together and Taking It on the Road” at Laguna Playhouse in support of their son Jesse Johnson, who stars in the show. The show written, directed and starring Gretchen Cryer was also attended by her son, Jon Cryer and his wife Lisa Joyner. The full house on Oct. 10 included Mayor Bob Whalen, whose daughter Ericka Schindele also stars in the show, as well as Playhouse members James Mellor, Glenn Gray, Paul Singarella, Tim Carlyle, Cody Engle, Melinda Masson, Lisa Hale, Tim Spangler, Terri Turner, Nicholas Yrizarry, Heidi Miller, Justin Myers and Cynthia Harris. Laguna Playhouse Women co-chair-Michelle Bendetti also attended along with 95th season gala co-chairs Melinda Masson and Barbara MacGillivray. The show runs through Sunday, Nov. 1, and tickets are $41-$66. Visit lagunaplayhouse.com or call 949-497-2787.